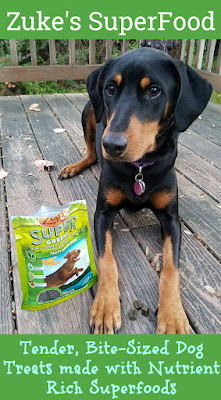 Disclosure: The Lapdogs are Chewy Influencers and received a bag of Zuke's SuperFood Blend with Great Greens dog treats, free of charge, in exchange for spreading the word about the product and Chewy. We only share information that we feel is relevant to our readers. All opinions expressed are our own. Penny is certainly the most active of the Lapdogs. Whether she's searching for hides at nosework trials, hiking with her humans, chasing her favorite ball (or a pesky squirrel), or working hard at getting her senior siblings to romp around with her, my Dobe girl's energy level is almost always a ten. So when our friends over at Chewy asked if we wanted to try the newly revamped Zuke's SuperFood Blend treats, we jumped at the chance. Okay, maybe Penny was the only one who jumped, but Teutul and Sophie got off the couch, and lined up to give them a taste test. While they all sounds fantastic, we decided to give the Great Greens recipe a try (you may notice we received one of the older "Super Greens" packages). While I may not get all of the super greens that I should in my diet, my dogs sure can! Zuke's sure packed a lot of nutrients into these tiny, tender bite-sized treats. Judging by the Lapdogs' reaction, I would have to say they packed a lot of flavor into them as well! Small in size + Big in flavor = A perfect reward for Penny's nosework training. Plus, the extra nutrients will help her keep that nose sniffing all throughout trial days! 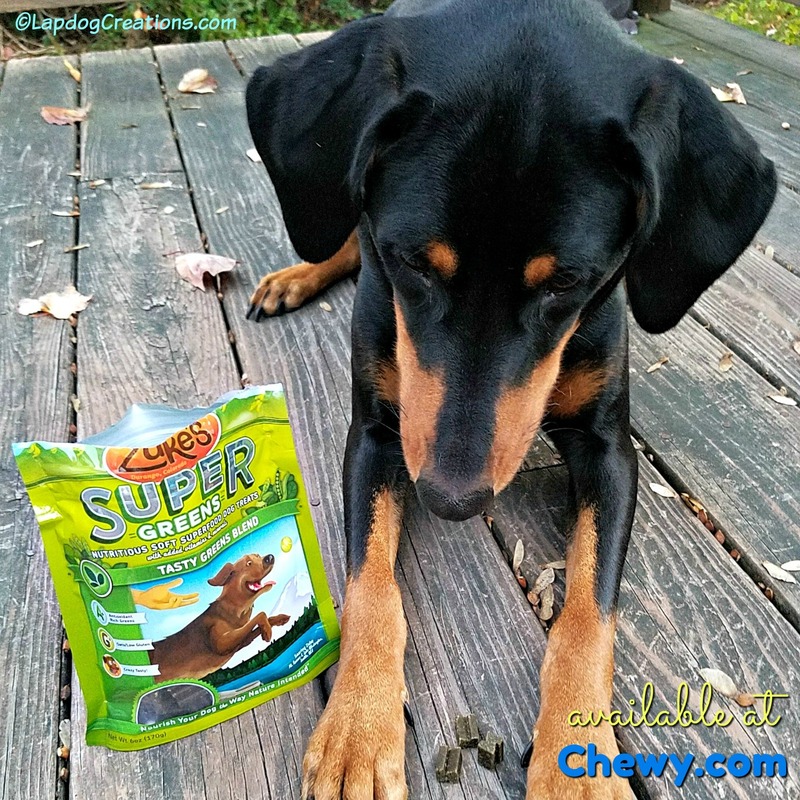 SuperFood Blend treats are also perfect to take along on walks and hikes. 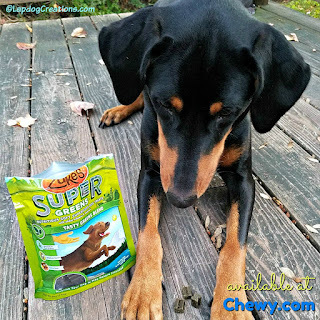 Rewarding your dog and giving them a little energy boost has never been easier. Reward your active dog with the nutrients they need, and the taste they desire. 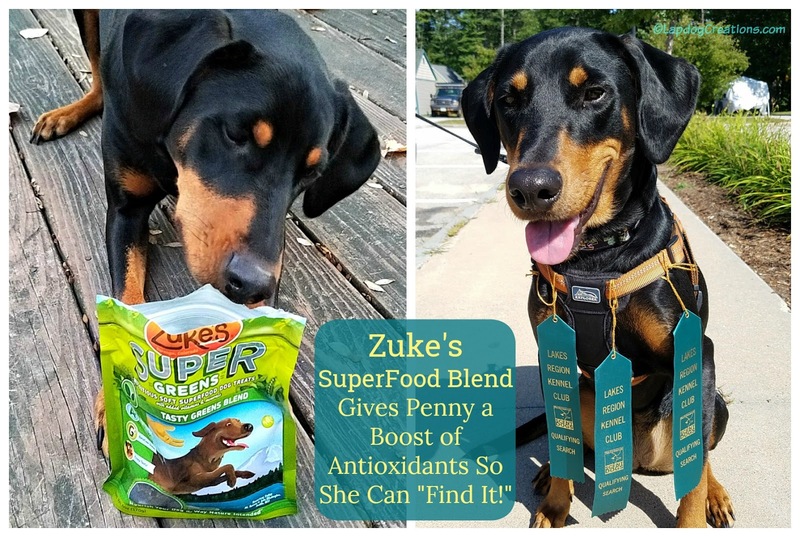 All three of Zuke's SuperFood Blend dog treats are available at Chewy.com where 1-2 day shipping is always free on orders over $49! We chose the berries and they are truly yummy. Mom likes the size but we wish they were bigger. In the top picture with all of her prize ribbons, Penny looks like she's smiling! Lady Shasta, my senior, has had these and loves the flavor. However I need to get more now that I have added Miss Maizie, who just turned 1 in August of this year - she is the one who is high energy and doesn't slow down much until time for bed.